I’m still hunting for my replacement bowl of ramen in Little Tokyo. Ever since Chin Ma Ya closed, I’ve been knocking on the doors of old favorites and new ramen houses. I’ve been temporarily satisfied with weekly fixes of udon at Marugame Monzo and pho at Blossom but I still want my ramen. 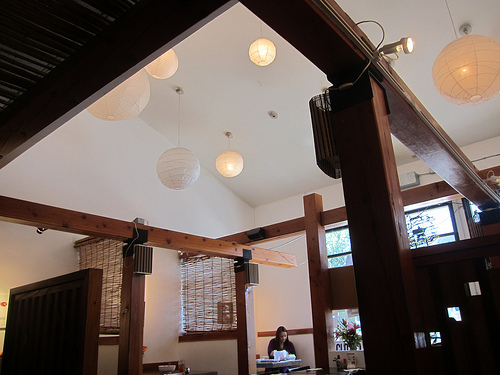 I found Ikemen Ramen to be a bit unwieldy– I think I’m just not a dip ramen girl (though their soupy ramen is just fine) and I thought it was just fine at Men Oh Tokushima Ramen. Who knew it’d be so hard to replace Chin Ma Ya when in all honesty, I didn’t care for it the first time I went. Maybe I should try Ikemen and Men Oh again but they’re very specific bowls and I found I like different types of ramen. Of course, I really love Daikokuya but the wait can be unbearable in Little Tokyo so I tend to limit my visits to the Arcadia location. Although I liked my small bowl at Kagura the first time I went, I didn’t care for the full bowl the next time I visited. 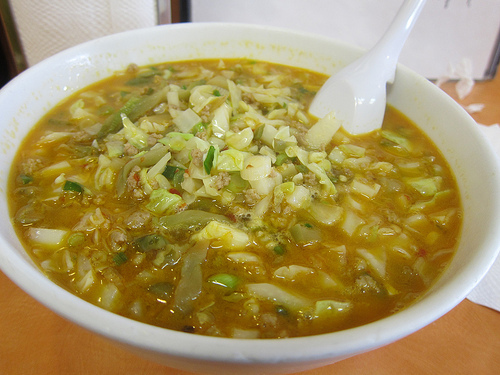 Shin Sen Gumi is also too busy for someone in search of a quick bowl before getting back to work. All this led me to try out TOT. I’ve come here off and on for years but always for dinner. I’ve never tried their ramen before. I usually get some sort of bento box type meal. I decided to try the gyoza and tonkotsu shoyu ramen. 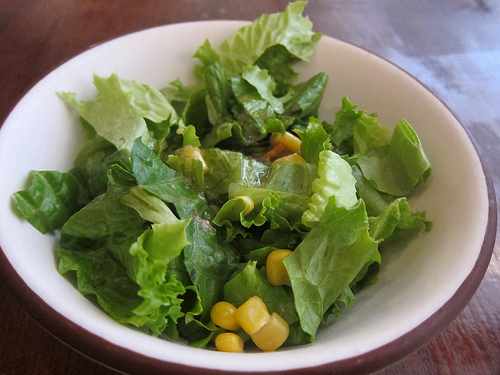 I was given their outstanding corn salad. It’s one of the reasons I love this place. The dressing is just right. 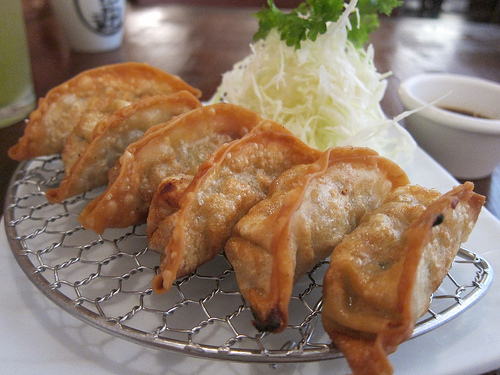 Sadly, the gyoza were super salty and looked like they had been fried in oil. 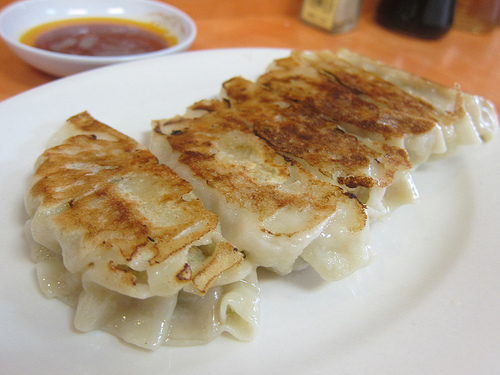 I prefer pan-fried gyoza. The dumplings did come on a cute wire rack though. Shoyu means soy sauce so it’s to be expected this bowl would be salty. It was made more evident after eating the gyoza. 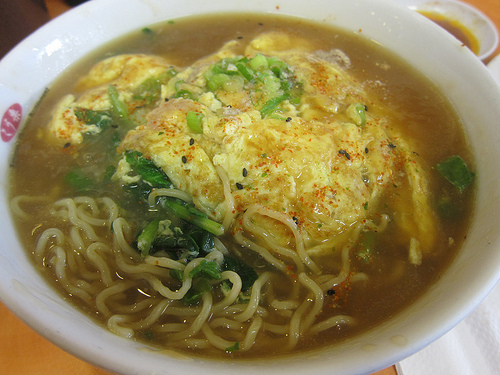 Perhaps I’d come back to try other ramens but I thought this was a pretty sad bowl with the overcooked egg. Go to TOT for the atmosphere and that corn salad! 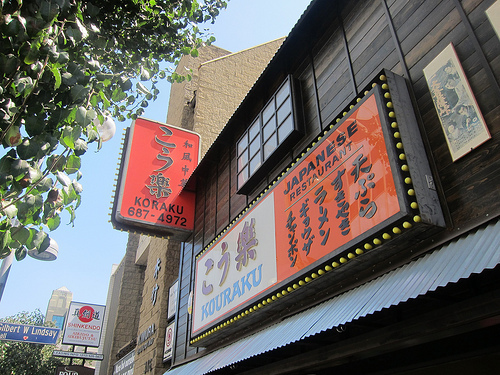 It’s been a few years though since I went to Kouraku also known as Koraku or Ko-raku — it’s spelled all three ways from their signage, menus and even the shirts the workers wear. I decided to check it out for ramen on a whim. I have these memories of it being greasy and dirty. But during the day, everything seemed clean and it wasn’t too busy just after the lunch rush. 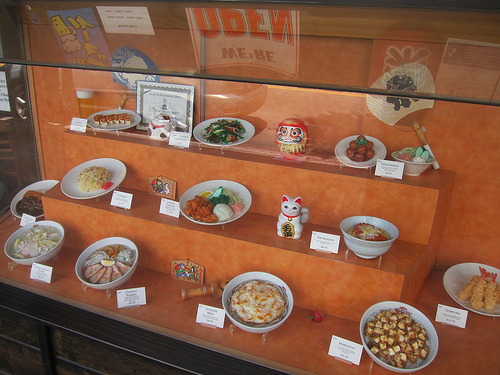 I do love a good display of Japanese plastic food illustrating their options. I got the gyoza and immediately I could tell these were good. They were flatter than most and seemed so airy. The wrappers were thin and delicate. With just a dab of vinegar and chili oil, these babies were ready to go. 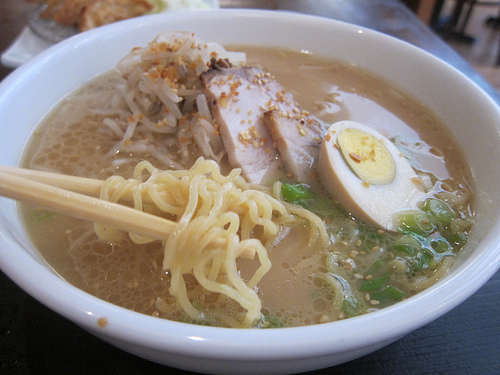 I admit, I was inspired by ramen I would order all the time at Ramenya in West L.A. Almost weekly for 2 or 3 years, I would go to this shop on Olympic. I’d either get ten ten men or ten shin men. Sometimes I’d stray to something else but these were my favorites. I loved this bowl of ten ten men (Chinese style ground pork and preserved vegetables) at Koraku! It had huge chunks of Chinese preserved vegetables. The soup was thick like gravy and I had trouble eating the noodles fast enough so they wouldn’t get soft. It was worth getting sweaty for eating this bowl. A couple of weeks later, I decided to try to recreate something I got at Ramenya. I asked for spinach to be included in the shrimp omelette. It worked out perfectly at Koraku. The spinach was very fresh and worth the extra $1.50. I may have found my new ramen restaurant. With a huge menu of different bowls, I can probably eat my way through it in 3 months and never revisit the same bowl.